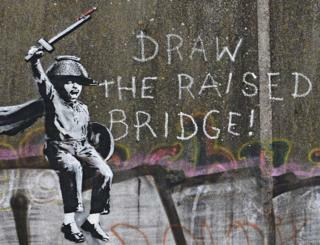 Plans to build a replica bridge to preserve a Banksy mural in Hull are to be discussed by the city council. The artwork appeared on the Grade-II listed raised bridge in Scott Street in January 2018. But surveys have found the structure is "likely to collapse within five to 10 years", the authority said. Under the plans, the Banksy would be moved into storage while "facsimiles of the original bridge leafs" are erected in the same spot. The mural would then be remounted so it can be kept "in its original location and retain its contextual relevance". Banksy's stencilled design depicts a child wielding a wooden sword with a pencil attached to the end. Next to it is a caption that reads: "Draw the raised bridge!" Within days of its appearance, the artwork was defaced. A protective screen was then put over it by the council. Councillor Daren Hale said other options had been explored, including placing the artwork in The Whalebone pub before it was decided the mural is too big to be accommodated there. He said he wanted the Banksy to "remain part of the thriving street art culture in this area". "In the meantime, it will be on display in a public building for the viewing public," Mr Hale said. Scott Street Bridge has been permanently raised since it closed to vehicles in 1995. Council officials previously said both sides of the bridge had to be removed otherwise it would "result in the closure" of the River Hull. The meeting to discuss the bridge plan takes places on 6 March.